Mortgage backed securities (MBS) suffered one of the worst weeks in recent times. As a result, mortgage rates continued to climb higher. After the recent MBS sell off, rates are now at the highest level since October, 2014. However, they are still ~.0.25% lower than at the same time last year. MBS is a type of bond traded on Wall Street. It’s daily yield impacts the mortgage rates. Just this past week, MBS lost a whopping 160 bps pushing the 30 Year Fixed rates over 4% for most borrowers. A quick look at top 4 banks (Wells Fargo, Citi, Chase and Bank of America) websites shows an advertised 30 Year Fixed Rate of 4.125% to 4.25% with APRs exceeding 4.30% in most cases. A wide range of reports in the U.S. and Europe over the past week indicated improving economic conditions. Good news for the economy is generally negative for mortgage rates. Following stronger than expected manufacturing and construction data earlier in the week, today’s Employment report exceeded forecasts in nearly every aspect. 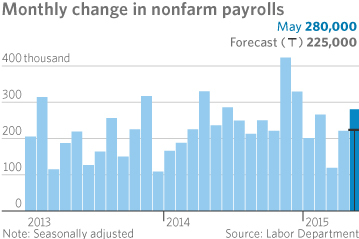 The economy added 280K jobs in May, much higher than expected. Average Hourly Earnings were 2.3% higher than a year ago, again exceeding the consensus. The strength in job gains and wage growth raised expectations for future inflation and brought forward the expected timing of the first federal funds rate hike. The economic data in Europe also was unfavorable for mortgage rates. Comments from the President of the European Central Bank (ECB) suggested that inflation is expected to continue to increase in the region. Investors are concerned with how the data might influence the bond purchase program of the ECB. Expect extreme volatility in the short run, before the rates stabilize. The stable rate will definitely not be lower than where it is. Given the bearish nature of the market, don’t be surprised that we see some more increase in rates before it settles into a tight range. Do not float your rate if you are closing in next few weeks. Also, if you were thinking of refinancing and can still benefit from current rates – lock it. Indications are, we have already seen the best rates of the year. So make the best use of what we have. The rates afterall, are still lower than same time last year and substantially lower than historical rates.